Precious metals futures mostly declined Tuesday. Palladium was the exception, posting its third straight record settlement. Gold for February delivery shed $4, or 0.3%, to settle at $1,285.90 an ounce on the Comex division of the New York Mercantile Exchange. "The safe-haven metals are being pressured by upbeat trader and investor attitudes early this week," Jim Wyckoff, a senior analyst at Kitco Metals Inc., said in a report. "Still, the bulls can argue the price weakness in both metals is just a normal corrective pullback following recent gains that pushed gold to a six-month high and silver to a five-month high late last week." Gold futures ranged from a low of $1,280.20 to a high of $1,291.40. They rose 0.3% on Monday. Last Thursday, they closed at $1,294.80 an ounce for their best settlement since June. 14. Ending lower for a third session in a row after rising for seven straight, silver for March delivery declined 4.3 cents, or 0.3%, to end at $15.713 an ounce. Silver futures traded between $15.56 and $15.75. They slipped 0.2% on Monday. Last Thursday, the metal registered its best settlement — at $15.797 an ounce — since July 16. April platinum fell $2.50, or 0.3%, to $821.80 an ounce, ranging from $818.90 to $830.50. 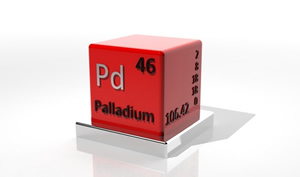 Palladium for March delivery surged $21.20, or 1.7%, to $1,261.40 an ounce — another new record close. Palladium prices traded between $1,236.30 and $1,270. Gold fell $5.75, or 0.4%, to $1,286.45 an ounce. Silver declined 11 cents, or 0.7%, to $15.64 an ounce. In LBMA results last week, gold rose less than 0.1% and silver advanced 2.7%. On Monday, Jan. 7, the United States Mint started accepting orders for its 2019-dated American Eagle and Buffalo bullion coins. Their sales today boosted the already strong gains from Monday. Advances on the day included a combined 2,500 ounces in American Eagle and Buffalo gold coins; 150,000 ounces in American Silver Eagles; and 1,000 ounces in American Platinum Eagles.